McCain debate delay: A snake-eyes roll? 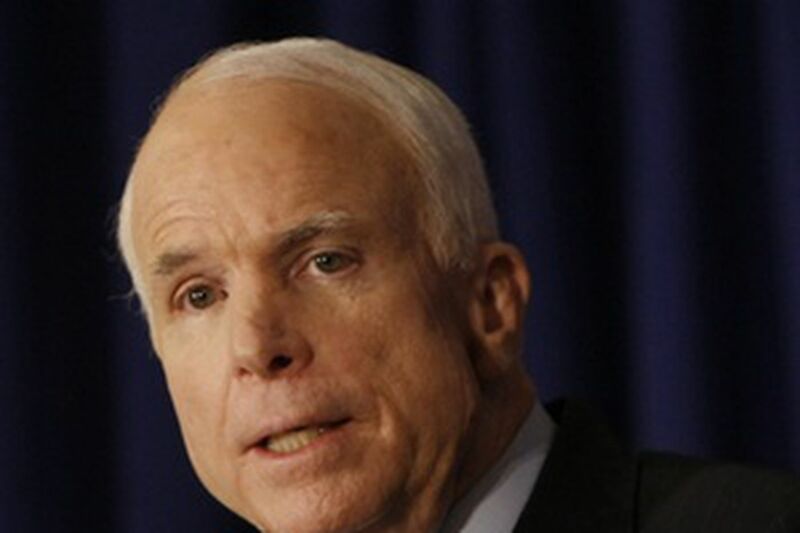 McCain's (left) call to postpone the debate may boost Obama's (right) standing. IN CASE YOU haven't noticed, John McCain likes to gamble. That's true both in the literal sense - aides say that the GOP presidential hopeful has been known to hit the high-stakes craps tables in Vegas - and in the political sense, as shown by his risky choice of once-obscure Sarah Palin as his No. 2. Now McCain is at it again, and the stakes couldn't be higher: With Wall Street's meltdown hurting his White House bid in the polls, the Arizona senator said that he's suspending his campaign to return to Washington and work on the mess - and he wants Barack Obama to agree to postpone their much-awaited first debate, scheduled for tomorrow night. "They view this as a second roll of the dice," said Larry Sabato, the University of Virginia history professor and presidential pundit, analyzing the McCain gambit, which even stole the spotlight from President Bush's prime-time address. "Sarah Palin turned up double 6's," Sabato added, referring to the initial big bounce that McCain received in the polls after picking her in late August, "but this one looks like snake eyes." Sabato was referring to what seemed to be an initial negative reaction to one part of McCain's shock proposal, to push back the debate in Oxford, Miss., with just two days notice, so that the two senators can work on the economic bailout. To many, that sounded like ducking, and a political ploy to boot. A so-called "snap poll" of 1,000 Americans taken yesterday afternoon by Survey USA found that only 10 percent wanted the debate postponed. Some 50 percent want the debate - slated to focus on foreign policy - to go off as planned while 36 percent say that the topic should now be the economy. Perhaps worse, McCain was getting slammed in the court of pop culture, especially by CBS late-night host David Letterman, mad that the GOP candidate canceled a scheduled appearance. "What are you going to do if you're elected and things get tough?" Letterman groused on his nationally televised show. "Suspend being president? We've got a guy like that now!" McCain and his aides insisted that his decision was not about his presidential campaign, but that without a bailout of Wall Street's toxic loan portfolio by Monday, the nation could slide into another Great Depression, and his involvement in the bill, as the GOP standard-bearer, is critical. Indeed, Bush - shortly before his televised address - invited both McCain and Obama to the White House, and Obama quickly accepted. "Following September 11th, our national leaders came together at a time of crisis," McCain said in announcing that he was suspending his campaign as of today. "We must show that kind of patriotism now." Ironically, it was Obama who reached out to McCain first, earlier in the day, with a proposal that the two presidential nominees issue an unprecedented joint statement urging Congress to work for some type of bailout plan, if not the current $700 billion package that has been sharply criticized. But while Obama did respond to Bush's meeting request - it would have been politically impossible to do otherwise - he had no interest in postponing the debate, which organizers have been working on for weeks. "This is exactly the time when people need to hear from the candidates," Obama said, adding: "Part of the president's job is to deal with more than one thing at once." The debate proposal also triggered a flurry of speculation that McCain's secondary motive might be to alter the debate schedule to push back the vice-presidential debate between Sarah Palin and Joe Biden, with polls showing that Palin's unfavorable numbers have been rising.